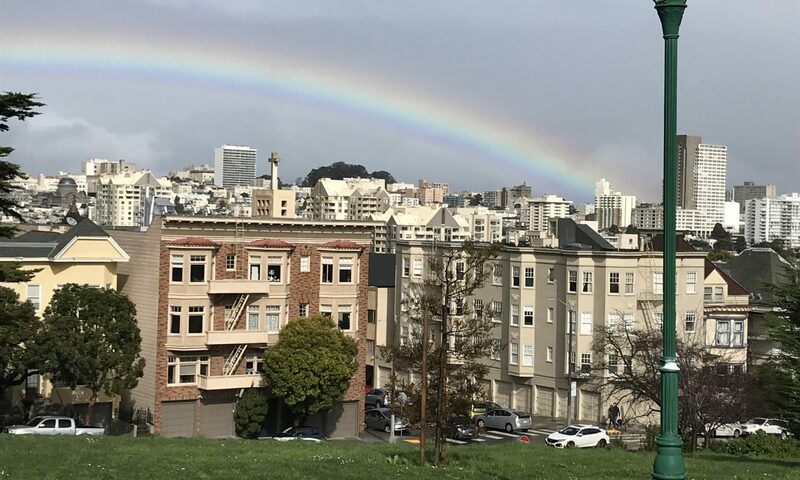 Springtime brings sun to the Mission, people on bikes, and the beginning of outdoor fun. This month, Spring brought up a different past where vacant lots began to grow lofts. I rode my bike through the Mission District about eight times a week back then, and began to feel the ‘hood change it’s vibe. At one point during a CELLspace meeting, the group broke down and began to realize that artists were leaving for cheaper rents. During an Open Studios Bar-B-Q on Florida Street behind CELLspace, folks from the nearby Bryant Square building were telling us about their eviction. It was Bryant Street’s last Open Studios, and a huge condo building was going up after the building got knocked down. And the artists all had to look for new digs. Pod was currently living there and angry about the whole thing. He was working on having a building-wide party there, after many people had already moved out. I ended up DJ’ing at that party, and Popcorn Theater took their customers to the party after the tour ended. In one empty studio, a camera pointed out the window to the new, yuppie restaurant, Blowfish Sushi. I pointed the camera out to a drunk group of folks in leather jackets, and the people in the studio got to watch it on a monitor. The yuppies noticed me watching, so they crashed the party. Pod gently explained to them what was going on, and I can’t remember if they understood. Artists kept moving out after the party, but Pod had another idea. His studio had an attic space, suitable for storing things and disappearing into if needed. One time he eluded the law by stowing away in the attic. Another time he wasn’t so lucky, so was eventually evicted from his studio. And his attic squat. As history moves, the people began to notice the change in the neighborhood. Marches happened, arrests happened, and the media began to cover the Gentrification fight in the Mission. Pod and his friends saw Bryant Square get knocked down. Then machines dug a hug hole in the ground. The hole was so deep, fresh underground water was pumped out of it 24-hours a day. Before the crane could get set up, the shady development corporation that funded the project crashed. Projects where scaled back, and the Bryant Square project was fenced in and halted. Until this Spring. Suddenly, years later, a 6-story tall crane appeared. I noticed it from my kitchen window. Neighbors worried that the new building would be too big for the surrounding area, and they were right. From all the way to Guerrero Street, this new building will be out-of-place. I rode my bike over there recently, and guessed that they where building underground parking garage. Before they build a huge 5-story rectangle of lofts and office space. We won’t even get into the Starbucks cafe that snuck into the neighborhood because it was called “Mariposa” Cafe when it opened back then. Nope. Won’t touch it…..
Suffice it to say that I changed my outlook on many things after talking to Pod at that Open Studios cook out. And at the same time, many of my friends and other people changed as well. And many of us fought back. And created art as protest against the rolling machine. And drew on the walls of evicted spaces, and had benefits and fundraisers. A few days ago, Dog Eared Books had a flyer in their window protesting three loft buildings going up on 18th Street. Dolores Park, Bi-Rite ice cream, BART? What isn’t there to not like about the neighborhood? But those pricy condos, and the pricy eats, etc. keeps the folks who where there before away from spending their money. So a condo boom fits right in with what’s happening. So the fight never really ended. Bryant Square finally gets built, and the beige paint and wooden fixtures of loftsville keeps spreading. I cling on to the old things: Workingmans, Mitchells, Zeitgeist. And continue to support the community that liked the diversity. That’s why I moved to San Francisco, so pushing it out just doesn’t compute. Every time I look out my kitchen window here at home, and see that yellow crane, I’ll remember visiting Pod in his attic squat. Helping him move out before the wrecking ball showed up. The sadness of an empty building, and the discomfort of a group of homeless artists makes that crane a horrible machine. So remember what happened, because you’ll need it to change what’s going on. And share it when you can, because a little knowledge can mean a lot for some.